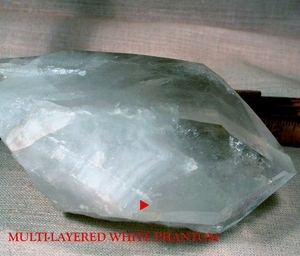 Large Arkansas Tabular Crystal, Large White Phantom: 2x 3 3/4x 6" tabular Arkansas crystal with a 1 1/2x 3" multi-layered rare white phantom along its' side, a 3/4x 2" rare iris [permanent rainbow], as well as a smaller one from another side. Half read-through, half various types of veils. Many record keepers, including one raised record keeper of 3/4x 1" high. Pronounced growth craters, one grazed edge, two small penetrators. Serious negotiator. Sits comfortably in your hand.